I’d be remiss if I didn’t mention the spectacular Eye on Springfield intro that kicks off this episode. Homer’s watching TV while Lisa is having a sleepover and Bart is attempting to hide from the gaggle of bloodthirsty girls. Homer finally bails and heads to Moe’s for a drink. (Where is Marge? Did Homer just leave the kids home alone? Is that okay?? Oh well.) Moe’s business is in a slump and he’s run out of beer, which leads Homer to flashback this great cocktail he made once when Patty and Selma were over showing slides of a recent beach trip. “As I stared up at that hairy yellow drumstick, I knew I needed a drink,” narrates Homer, and he heads for the kitchen. They’re out of beer (D’OH!) so he grabs every bottle of liquor out of the cabinet and dumps them into the blender. This mistakenly includes Krusty brand grape cough syrup. The drink is accidentally set on fire by Patty’s cigarette, but luckily “fire made it good.” Moe has Homer remake the drink at the bar, and finds that it is, in fact, delicious. 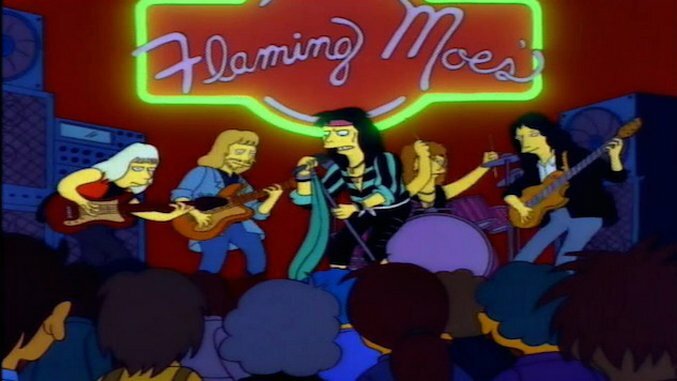 He quickly takes credit for the purple drink and his now ­popular bar is renamed Flaming Moe’s. Moe hires a waitress, has repeat offers to sell the recipe, and is all­-in-­all living it up. Aerosmith makes an appearance and is coaxed on stage by the promise of free pickled eggs. Homer becomes obsessed with how Moe has wronged him (“All work and Moe play makes Moe a Moe Moe.”). Meanwhile Moe (unbeknownst to Homer) is finally doing the right thing and agrees to sell the drink and split the profits with Homer. Just before he can sign the paperwork, Homer pulls a Phantom of the Opera and spills the beans. Now that the recipe is public, Moe’s bar is no longer popular and Homer and Moe make up real quick just in time for the credits to roll. So… how do you make a Flaming Moe (ahem) I mean Homer? When watching the episode, a few things can be plainly seen: Creme de menthe, tequila, Schnapps of some kind, and Krusty brand cough syrup. Otherwise the drink includes swigs from a number of other unmarked liquor bottles. It’s a catch­all drink with a nice hit of bright purple cough syrup and a fiery finish. Now, there are a number of sites that have bar recipes for a Flaming Homer/Moe. None of them are true to the episode, and if you make this, you will see why. It’s crazy gross! including tequila, some kind of Schnapps, and creme de menthe into a blender. 2. Add a healthy glug of grape cough syrup and blend together. Mmm… healthy glug. 3. Serve in a beer mug and light on fire. Note: It really won’t want to light on fire. Since companies don’t make high­-proof cough syrup anymore, the drink’s alcohol content will just barely be enough to let off a tiny, tiny blue flame. If you want a slightly bigger flame, pour a small amount of high-­proof alcohol (like 151 rum) over the back of a spoon and onto the top of your finished drink. Ignite. One more note: Don’t drink this. It is crazy gross and warm and can’t be good for your body. Alright, so maybe wishing for a drink from The Simpsons wasn’t the best idea. There’s a chance that if I had drunk the whole thing that I would have, in fact, gone blind. Do not try this at home. Instead, try my Not­So­Flaming Homer! It gets a hit of color from blue curaçao and Campari, includes the requisite tequila, and is garnished with mint. It’s a little tropical and really colorful, and if you pour a little high­-proof rum on top, you can set it on fire (again, don’t expect Flaming Moe­worthy flames, but still). shaker with ice. Shake until very cold. needed and stir. See the note below if you want your drink fiery. 3. Add ice and garnish with a sprig of mint. Check for blindness and then enjoy. Note: If you prefer your drinks flaming, slowly pour a small amount of Bacardi 151 or other high-proof alcohol over the back of a spoon and onto the top of your finished, ice­less and mint­less drink. Use a utility lighter to light the surface of the drink before serving. A final note: be careful, you guys. Fire plus alcohol equals danger. Just ask Lenny!